Don’t feel the least bit guilty about assigning chores for kids! It’s the best thing you could do for your homeschool children! Most children, once properly taught, can do most anything on their own. Who better knows your child's physical and mental capabilities than you, anyway? Children need to learn how to work and there's no better time to start than now. They will learn best from you. Have you noticed the deterioration of the work ethic so commonplace in society now? I believe it all stems from children not having to pull their own weight at home. 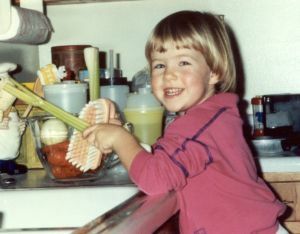 Laura, age 3, washing veggies for soup. Nowadays, youth think the world owes them a living because their parents always gave them everything. Your children are going to be different. The best place for them to learn how to work is in the home. The benefits of using kids chore charts include thoughtfulness, promptness, orderliness, responsibility, efficiency and honesty. The list does not end there of course! These attributes shine when the time comes for them to apply for employment down the road. As soon as they start walking! They can put their clothes in the hamper or put away toys. 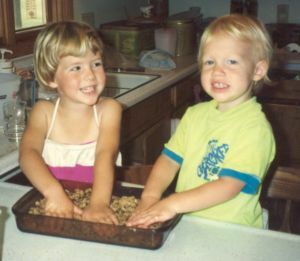 When they’re tall enough, around age three or four, they can be helping in the kitchen. This is the age they want to help. Try having them stack the clean plates from the dishwasher! Laura and Emily liked to make meals. Six and seven year olds can dust, vacuum and help sort the laundry. As they work alongside you, it’s not long and they will be able to do most anything…by themselves! Spending a little time each day doing some simple tasks will also keep the clutter at bay! Chores for children have the advantage of preparing them for working outside the home as a teen. There is always someone needing help with their lawn or to care for a pet. Who knows, your child may even start his/her own house cleaning business! It’s a natural step toward employment, which brings added income. Another win-win! Need a Chore Chart? Print one for free!